iRide the bus because it benefits Central Texas, costs me nothing (as a Capital Metro employee), and (hopefully) makes me a better transit planner. 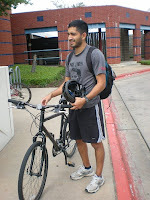 I ride my bike because it benefits Central Texas, costs me nothing, and provides a fun challenge. Though I have to admit, it is definitely more enjoyable riding downhill to our East Austin office in the morning than battling the afternoon heat, hills, and traffic. On days when I’m not up for the full 8-mile trek homeward, I end up biking through the shaded Govalle neighborhood to pick up the #350 Airport Blvd., which works out well unless the bike rack is full. Another preferred multi-modal option consists of the Lance Armstrong Bikeway (East 4th and 5th Streets) to Downtown and boarding whichever northbound bus arrives first. When MetroRail opens this summer, I will be one of many taking advantage of the 15-18 minute travel time from Crestview to Saltillo/Downtown. Both the City of Austin Bike Program and Capital Metro boast extensive and for the most part, complementary, route networks but as the area continues to expand and densify, it is essential to adjust accordingly. City of Austin is in the process of adopting Austin 2020 Bicycle Plan, and Capital Metro is currently in the early stages of developing ServicePlan2020. Both efforts will identify and recommend which changes need to occur to improve each system and increase ridership. Enough planning talk. Riding a bike is fun. Pick a day to give up your car this month. Air up the old 18-speed and make your way to that bus stop you claim is beyond walking distance. The environmental and personal benefits easily outweigh the sore legs. Faster Trains Coming Your Way: "Look, Listen, Live"
What do you do when the bike rack is full? Are drivers allowed to let you bring bike in the bus if there is room? Or are you going to wait 20 minutes for the next ride? If you depend on the bus for a leg of the commute, then this can be a problem. Not to mention being sweaty at work – especially for office workers. You can’t take your bike onboard the bus, so if the rack is full, you have a couple of options: wait for the next bus (or take a different nearby bus route), or lock up your bike near the stop and get on the bus sans bike. Lefty, I’m not keen on the sweaty part, either. We are fortunate to have shower facilities here at CapMetro. My route calls for a mile ride to the 1L, about 3 miles to the Tech Ridge Station, and 3 miles riding to office in Pflugerville. Walking the last 3 miles not really an option. Any plans for extending routes into Pflugerville? Or any further North? I guess I need 2 bikes. Lefty-As it stands, Pflugerville has not expressed interest in plans for transit expansion. We are in the process of planning for many areas that aren’t currently within CMTA’s service area, but unfortunately, PVille isn’t one of them.